A major earthquake struck in the Gulf of California near Baja California, Mexico, at 8:17 a.m., Friday, Jan. 19, according to the U.S. Geological Survey. 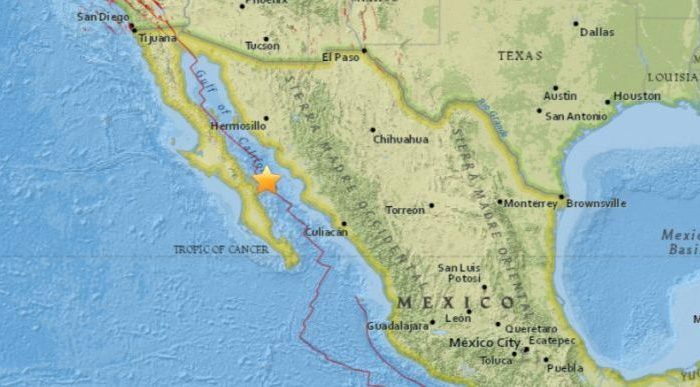 The preliminary 6.3-magnitude quake hit about 50 miles south of the city of Guaymas, Mexico, the agency said. The temblor hit at a depth of 6 miles. It’s not clear if there were any reports of damage or injuries. It comes a few months after a severe, 7.1-magnitude earthquake hit Mexico City, killing hundreds of people and toppling buildings. Mexico is located on the Pacific Ring of Fire, the world’s most seismically active region. The ring is a chain of active volcanoes and earthquake-prone spots running around the Pacific Ocean. The USGS estimates that about 90 percent of the world’s earthquakes occur along the ring.